Singaot Musik Kamp (or "SMK" as it is popularly known) was a huge success in Vanuatu this October with over 60 musicians participating in the events, hailing from Pacific islands including Tonga, Samoa, Fiji, West Papua, Solomon Islands, Vanuatu, New Caledonia and Papua New Guinea, African countries Mozambique and La Reunion, and Austria and Australia. With such a diverse group of talented traditional musicians, it was sure to be an incredible experience for all! Singaot Musik Kamp (SMK) is part of the "Music Bridges" action funded through the European Union's Africa Caribbean Pacific (ACP-EU) Cultures+ program. Music Bridges is managed by a non-profit organization, Coordinamento delle Organizzazioni per il Servizio Volontario (COSV) in Italy and includes project partners, Music Crossroads in Mozambique and Further Arts in Vanuatu. The camp was coordinated with the help of the local Santo youth-led association, Canal Studio. SMK hosted the musicians at a residential music camp in Mon Exile village, Santo - a major highlight of the camp. The artists lived together in the specially built leaf and bamboo walled huts, playing music and sharing stories every day under the coordination and care of a local team of over 30 staff and volunteers and 15 media crew members. At the opening of the camp, a very special traditional ceremony was performed by the local team to thank the community, traditional landowners, and local government representatives for their hospitality and contributions, and to welcome the musicians. All appreciated the depth of respect showed towards one another and local traditions. And in particular, everyone enjoyed dancing and singing with the Kastom performance guests from local villages, as well as detainees who built the camp shelters. The SMK group performed its first full show at the Lukaotem Gud Santo Festival on Friday 11th October to the local people of Luganville town in Santo. It was a spectacular moment as the huge group took to the stage and performed together as an orchestra, presenting song and dance from the different countries and islands represented in the group. The group then performed together at Fest'Napuan Music Festival in Port Vila on Saturday the 19th starting with a street parade through Port Vila town to the festival site where they shared a few songs with the daytime audience for the festival celebrating traditional culture and customs. Both at LGSF and Fest'Napuan, groups within the SMK Orchestra also presented their individual acts, bringing life and a diversity of music styles to the audiences of Luganville and Port Vila. These acts included: Impossible Odds (Fred Leone), Music Crossroads Mozambique, Rize of the Morning Star, Airileke, Simangavole, 1606 Jammin' Band and Kaumaakonga. In Port Vila, the musicians lived in the two villages of Pango and Mele on the outskirts of town, hosted by the local communities. When the festival came to an end, the event program continued with three days of workshop sessions on ‘Music Development and Rights' developing the musicians in their vocation as professional artists, and equipping them with the knowledge and skills to use copyright and licensing measures to further their careers. There were many other participants at the workshops coming from various organisations, youth and music groups in Port Vila. The SMK Program was a huge undertaking! It was foremost an important opportunity for musicians of diverse backgrounds and cultures to meet and network; share and learn traditional song and dance; and acknowledge the diversity of culture that exists locally, and with international guests. 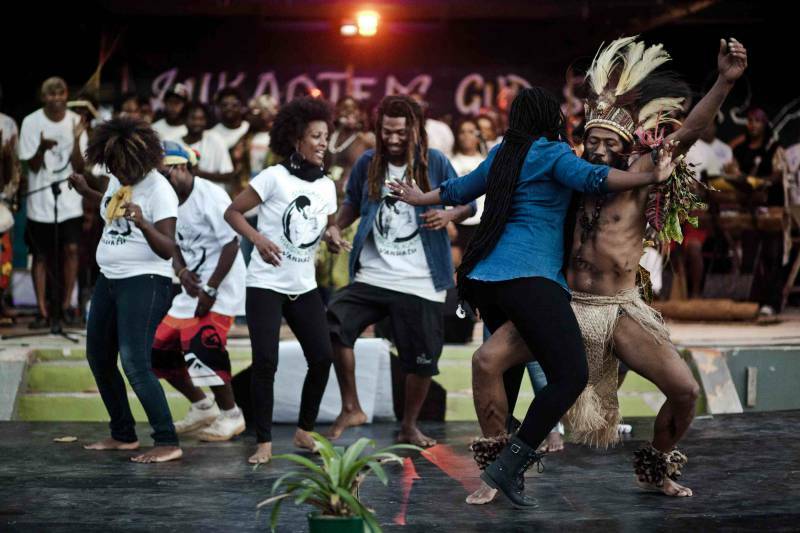 It was also an rewarding experience for the camp staff and volunteers as they developed their capacity to deliver a project of such as large scale and high quality, and to build relationships in working with one another and the artists, and even with local stakeholders in Vanuatu. "We will be able to share these new skills we've learnt back home with our new music generation." "SMK helped me to mix traditional music with modern music. I really hope there is another music camp in Vanuatu!" "The best part of SMK was… camping in the bush listening to the drums at night and witnessing the beautiful voices from the musos." "SMK is the kind of place all musicians should experience. It is not just a musical collaboration but a cultural and spiritual one… the kind that I feel rarely take place, or at least not enough… music is one of the most vital and important tools we have to express ourselves and to connect and reconnect to each other and our shared hopes for a better future." "SMK gave me a greater understanding of time signatures and melodies of the various country groups who came to share. It has stretched my network of musicians and contacts into countries I may have never had the chance to do this with until SMK." "I really enjoyed the workshops - they helped me to understand the issues of the music industry in Vanuatu and what we need to do now. I want musicians to come together to come up with a good strategy to improve and promote ourselves and our music."